Yes, I know.... Sorry. I've not been very active of late, have I? Dear dear... so much has gone on! Anyway, I figured it was about ruddy time I uploaded the full book of Dead Night, which you can now read (sorry about the wait! ), and had a spring cleaning, updating everything! You will see there's now a contents page, to make the blog far easier to navigate (I dislike the little posts widget at the side with a vengance, and one day it will meet my LASER GUN), and also, my profile AND the spoilers for the next books have been updated. The sad news is, the Dead Night Film Project has been cancelled as we can't for the (after)life of us find some of the characters, but if a fortunate turn of events happens, you, my faithful fans (or freaked out passers by), shall be the first to know! Also, finally... 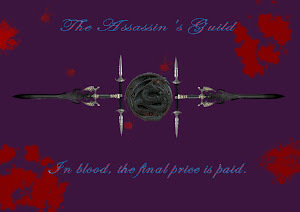 I shall be uploading a series soon entitled the Seven Sins of the Guild. (visitors of my earlier blogs will reconise it) Just to tide you over until the next book. Now, that shall be all, I think.... nothing more to report! This is me, TakaraYuuki (or Im, whatever) signing out. Until the next time!